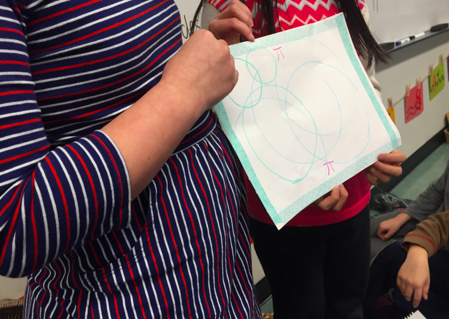 April thinking together: How do the core competencies connect with mathematics? 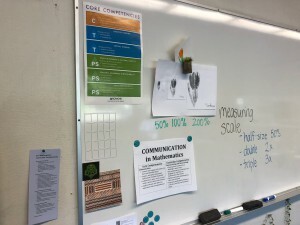 The Core Competencies are at the centre of BC’s redesigned curriculum and underpin the curricular competencies in each discipline, such as math. An overview video about the Core Competencies can be viewed HERE. Drawing from global education research and through provincial consultation with stakeholder groups, three Core Competencies were identified – Thinking (creative and critical), Communication and Personal & Social (positive personal and cultural identity, personal awareness and responsibility, and social responsibility). 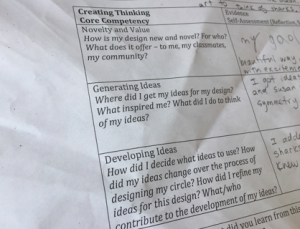 As we develop awareness about the Core Competencies during the school year, we consider the ideas of “notice, name and nurture” – looking for evidence of core competency development or application in our classrooms and schools. In our district, we have created Core Competency posters in both English and French, overviewing all the core competencies as well as posters specific to one core competency (all available through the district portal). These posters are up in classrooms and schools to create awareness and develop common language around the core competencies. Other times, I will ask the students to reflect on their last experience in The Studio and consider what they need to work on around communication, either personally or as a class. We have woven self-assessment and reflection about the core competencies into our projects and learning together throughout the year. During the last school year, there was a requirement for students to do a “formal” self-assessment to be included in the June report card. 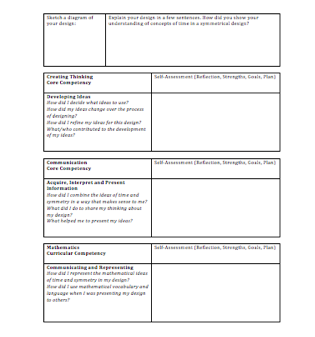 For students to authentically self-assess and reflect, they need to be familiar with the language of the core competencies and be able to connect to learning experiences they have had throughout the school year. 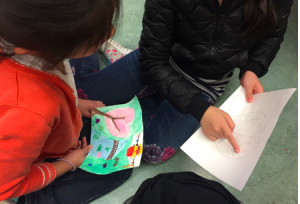 During the third term last year, the grades 3&4 class from Grauer visiting The Studio weekly to engage in a mathematics project around the work of Coast Salish artist Susan Point. At the end of each session together, we had the students share their learning – what did you learn? how did it go/what did you do? what’s next for your learning/what are you wondering about? 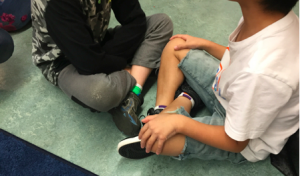 Sometimes students turned and talked to someone near them, other times, students shared their learning and thinking to the whole class. 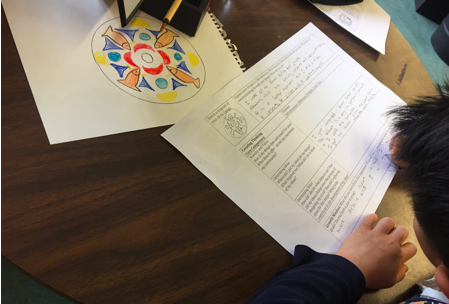 Every few weeks, we had the students do a written/drawn self-assessment and reflection. 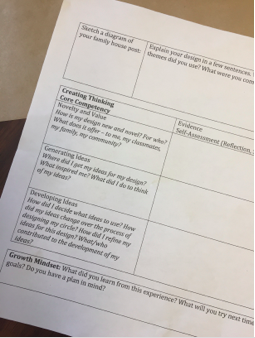 We have found that using question prompts to support reflection and considering evidence of learning has been the most authentic and personalized way to have students think about and connect to the core competencies. We developed some recording formats to capture students’ thinking, with the clear intent that students are not expected to “answer” all the questions – that they are they to prompt and provoke reflection and self-assessment. A team of Grauer educators were working together on an Innovation Grant project around creative thinking and growth mindset and we wove these ideas in to some of the self-assessments. What opportunities have students had to experience and develop the core competencies in their mathematics learning? 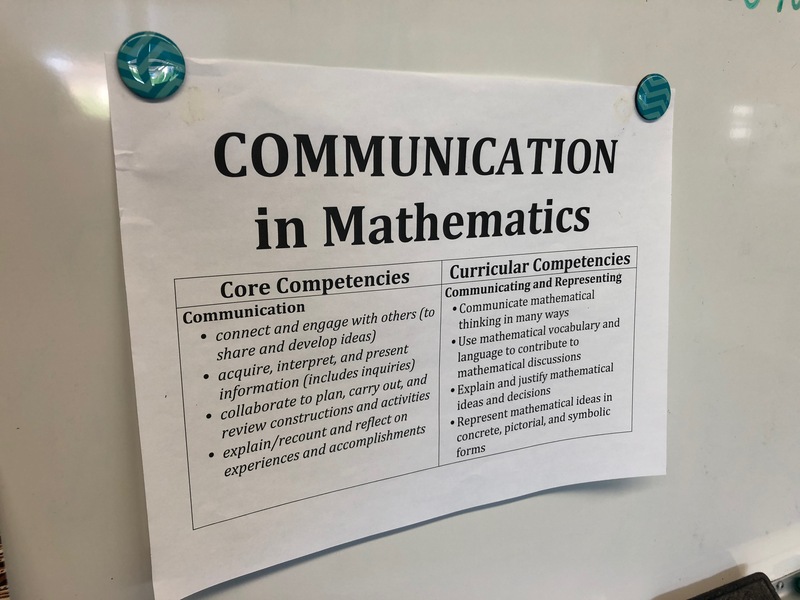 What opportunities over the school year have students had to name and reflect on the core and curricular competencies in mathematics? 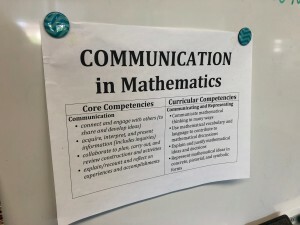 How have we made the core competencies and curricular competencies in mathematics visible in our classrooms and schools? How have the core and curricular competencies language and ideas been embedded in the mathematical community and discourse in our classrooms and schools? 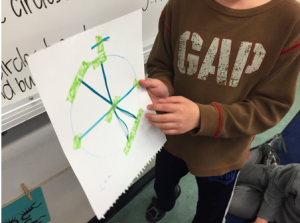 What different ways have students been able to share, reflect on and self-assess their mathematical thinking and learning?